A beautiful theme based on CreativeTim Argon. 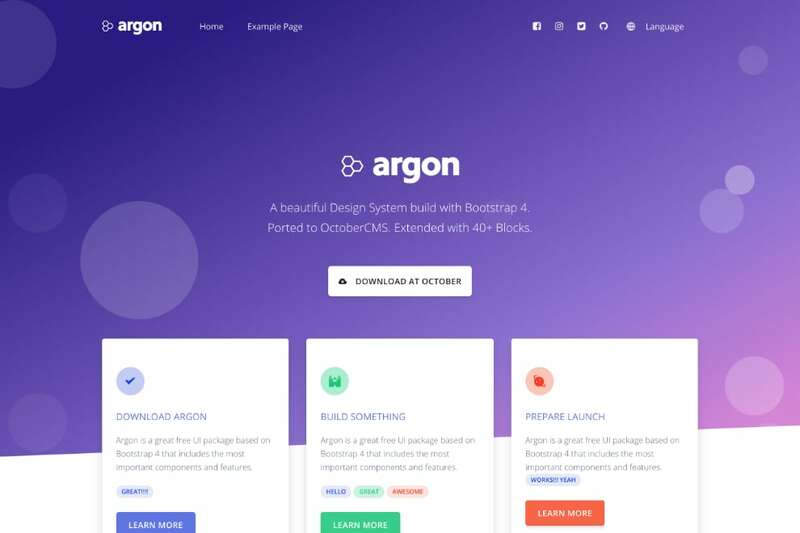 Comes with a simple page builder and custom blocks that extends Argon Design System. Get help in the theme support forum. 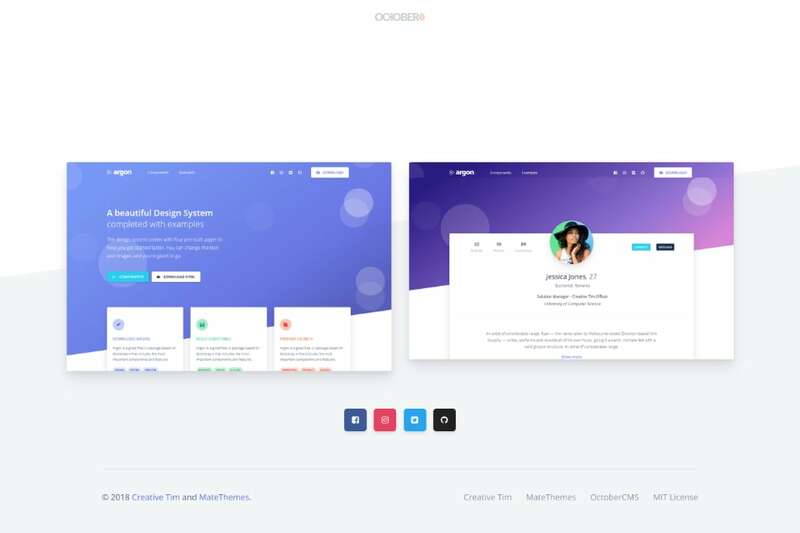 This theme is developed by CreativeTim and we have ported it to OctoberCMS. MateThemes also add custom blocks to it. We have extended it with a simple PageBuilder-System for easy content and page management. If you have any suggestions for new block types or a plugin integration please tell us! Have fun with our great theme. AND: If you like our theme, please leave us a good review! # 10 in Free of all time. 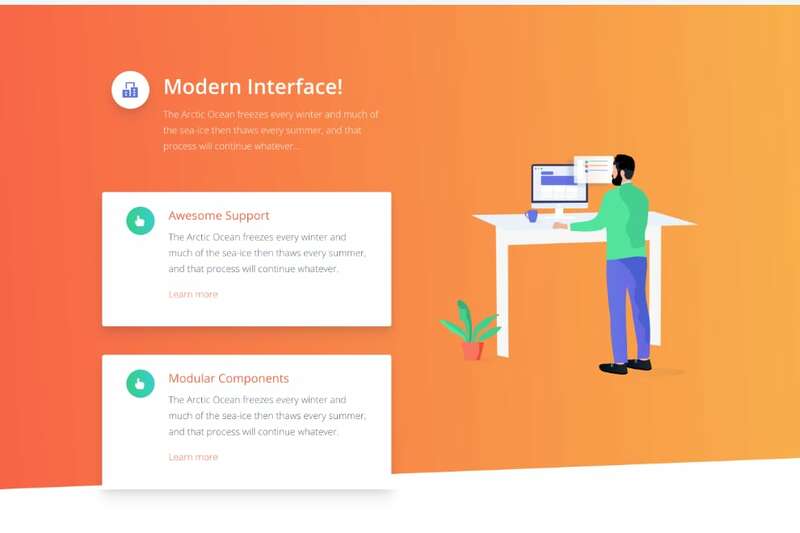 You find a documentation for Argon Design System over here Creative Tim. We use the build in SCSS-Compiler from October. The first page load takes a bit time. If you want to use your own Compiler or your precompiled CSS you have to change the markup in "Partial -> site -> tmcss.htm". Please note, that we use the SCSS Folder for custom markup in our own blocks made for Argon. Make sure that you don't forget to include this files in your CSS. We have included several Meta Tags. You will find the Partial in "partial -> site -> tmmeta.htm". For our Blog, there is a block where the Meta Tags are defined. The Tags are related to the url, if you change your blog url, you need to change url in tmmeta too, otherwise they won't work. Note: RainLab.Translate must be installed. The theme won't work proper, because we use Translate Strings. So please install RainLab.Translate. We set the plugin to required. Normally it must be installed after you purchase the theme and install it. This theme has not been reviewed yet. Please login to rate the theme or write a review. ADDED - Disqus comments added. UPDATED - NEW Block added - Pricing Feature One. FIXED - Language Switcher Component added to DefaultCMS-Layout. ADDED - RainLab.Blog and new ThemeSettings. ADDED - CMS Error Layout for 404 and Error Page. IMPROVED - Blocks.yaml cleaned up. Now follows a convention => Label => Comment => Field Type. IMPROVED - Moved GoogleFonts from Partial tmcss.htm (Header) to tmscripts.htm (Footer) for better pagespeed. FIXED - Footer now show Images if you want, like in the Demo if the Theme (use it under Theme Settings -> Tab "Footer"). IMPROVED - LazyLoad Images with UnveilJS. IMPROVED - Page Preloader added. IMPROVED and ADDED - Rewrite of ThemeSettings. New Favicon Tab in Theme Settings and Theme Partials. FIXED and IMPROVED - Header Brand Logo in Theme Settings and Theme Partials. Stable enough for Release. Still in BETA (More Features will be added. 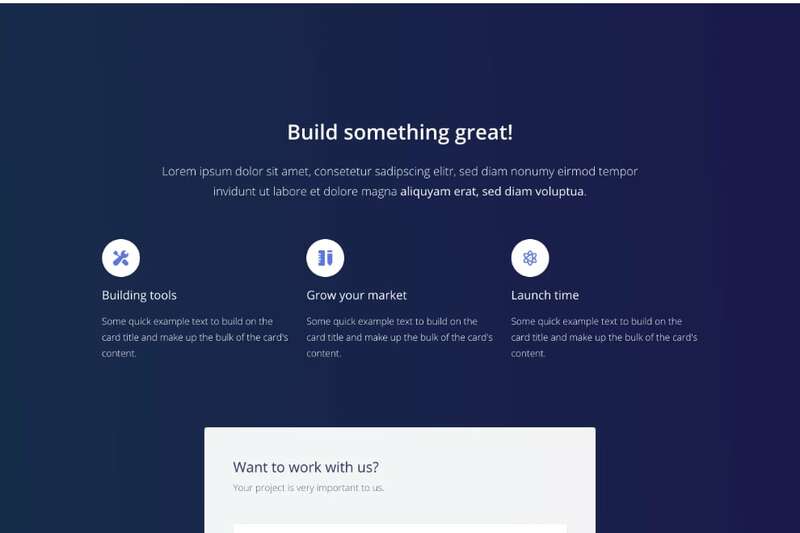 Stable enough to build a great website.). Theme Settings added. Still in DEVELOPMENT. Better Multilanguage Support. Still in DEVELOPMENT. GradientBlock and IconsBlock added. Still in DEVELOPMENT. LogoBlock, Team Block and Text Image Block added. Still in DEVELOPMENT. CalltoAction and ImageText Block added. Still in DEVELOPMENT. Unveil Script added for LazyLoad Images. Still in DEVELOPMENT. Several other Blocks added. Still in DEVELOPMENT. Hero and Features Block added. Still in DEVELOPMENT. 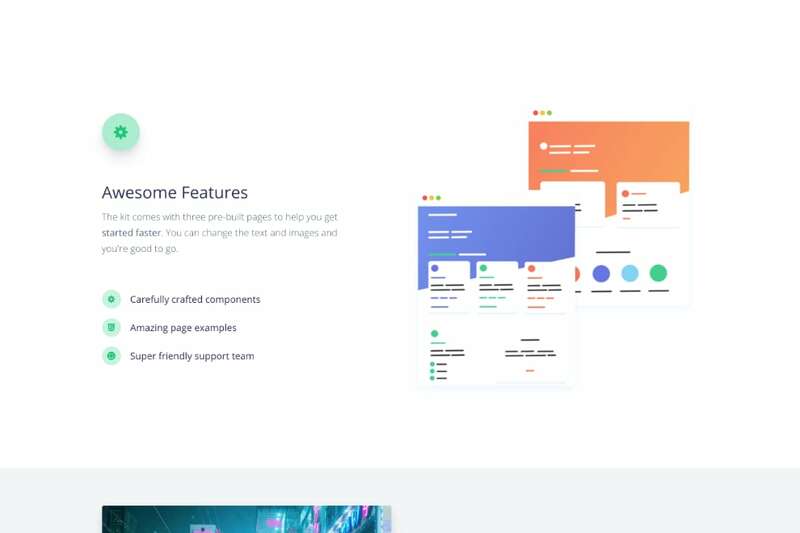 PageBuilder added. Still in DEVELOPMENT. StaticPages added. Still in DEVELOPMENT. First version of Argon Theme. Still in DEVELOPMENT.